I wasn't quite sure what to expect when I started reading The Fourth Fisherman by Joe Kissack. I ordered because I think survival stories are interesting, but then when I read the description more closely it almost sounded like it was going to be an autobiography. But when I started the book it sucked me right in. It turns out it was both - a survival story about three fisherman who were lost at sea and and autobiography of the author. It sounds odd when I say it like that, because it doesn't seem like the two stories would fit together, but they do. I liked how the author was able to tell both stories at once - it kept it interesting to me. I think after reading this book, the best way to describe it would be to say that this book is a testimony. A story of how three men were lost at sea for nine months and God's faithfulness saw them through. And a story of how one man who found himself lost in life until God found Him. I love reading testimonies of how people come to know Jesus and how God has worked in their lives, and this book was right up that alley on multiple fronts. I enjoyed it, and I would recommend it! Note: I received this book for free through the Blogging For Books program in exchange for this review. This is my honest opinion. Just hanging around the house this week - Gwen started to show an interest in her floor gym, and Wyatt made a phone call to my mom when I wasn't paying attention! I love these ones of my kids smiling - sometimes my favorite pictures aren't always technically perfect, but they capture a perfect little moment in time, like the peak of a smile. And I love them for that. Gwen is four months old! I feel like the last four months have gone by so fast. I don't remember it going by that fast with Wyatt. This month has been a little crazy - it started out a few weeks ago with Gwen getting sick for the first time! Poor baby. It was just a cold, but it led to a few rough nights because she couldn't sleep and breath comfortably on her back, so she ended up sleeping part of a few nights in bed next to me. It was the only way I could keep her comfortable and get her to stay asleep. I think her being sick kind of messed up her sleep schedule, because she's only slept a full 8 hours a couple times since. She's mostly just been going 4-6 hour stretches at night for the past couple weeks - not bad at all, but not sleeping through the night. I was looking back through Wyatt's monthly updates though and he had a rough sleeping patch around four months old too, so it could also be a growth spurt. This past month I went back to work, and Gwen has had to get used to taking a bottle from my mom! She's not as good at taking a bottle as Wyatt was, but she will when I'm not there. She's drinking about four-ish ounces at a time when she takes a bottle. When I'm home she nurses probably 4 or 5 times during the day, and then however often at night. She's wearing a mix of 0-3 month clothes and 3-6 month clothes now. Her newborn shoes are getting too small, but I don't really have any 0-3 months shoes at the moment, so we mostly just do socks right now . . . I'm waiting to buy her some little summer shoes when the weather gets a little warmer. She wears size 2 disposable diapers, and when we do cloth she's on the smallest size. At her doctor's visit we had her measured, and she's 15 lbs, 2.5 ounces (60%), her head circumference is 17 inches (96%), and her height was 26.5 inches (99.8%)! She'll do tummy time, but I think she mostly doesn't see the point of it - she'll just lay there and look around with a puzzled expression on her face, like she's not sure what we want her to do! No rolling around these parts yet, though she's gotten close a couple times. If Wyatt comes anywhere near her though she's as happy as a clam. She loves Wyatt. And Wyatt never turns down the chance to give her a kiss or help take care of her. She's starting to show a little interest in her toys when I put her under her play gym, but especially when Wyatt shows them to her! They are so cute together. One thing that I think is funny is that Gwen loves to see. Wyatt used to snuggle into me when I held him facing me, but Gwen gets impatient - she wants to be turned out. She likes to be able to see around her. She hates to be left alone laying down - if I need to set her down for a minute she wants to be propped up or in her Bumbo so she can look around and see what's going on. Her little personality is so sweet! She's such a smiley girl. If anyone stops to talk to her, she'll give them the sweetest little grin, and when Derek and I talk and play with her, her whole face just lights up! She gives the biggest gummy smile whenever we pay attention to her, and she brings her little fists up under her chin - if she's wearing a dress she'll grab the fabric and pull it up to her face and just peek out at us from behind it with her smiling eyes. It's the cutest thing! She also gave a first real laugh on April Fool's Day! Derek was playing with her and heard her laugh. We thought it was such an appropriate day for a first laugh. She's been laughing quite a bit ever since, and Derek got her laughing pretty hard the other day by making robot-like noises - she thought he was so funny! I caught it on video - use my blog name as the password. 100 0067 from Callie on Vimeo. She likes to blow raspberries lately - I'll set her up on the couch and she'll just look around and blow raspberries and spit bubbles. It's cute! She also loves kisses. She gives the sweetest little smile every time I give her a kiss. With sickness going around to everyone in our family this month, I didn't take as many pictures as normal, and I'm determined to do better next month - she's growing so fast! I want to catch all these little stages while I can. You are such a sweetheart, Gwen! I can hardly even have a bad day with you around - your smile just lights everything up! You are so beautiful, and especially when you smile. I try to get you smiling as much as I can because I just love to see you happy. You usually eat right around the time Wyatt goes down for his nap, and sometimes I'll feed you and then lay you down for a nap too. But this week I found myself just holding you, and watching you until you fell asleep - and then I couldn't bear to put you down. You look like a doll with your eyes closed, and I can feel your little tummy go in and out against mine as you breathe and dream. You are so peaceful when you sleep, and as you get bigger I know you are going to sleep in my arms less and less . . . and soaking it up is more important sometimes than checking something off of my to-do list. You are my gorgeous girl, and these days with you are precious, Baby Doll. I don't want them to go by so fast. I love you so much, and every time I look at you it washes over me again. I'm so glad you are mine. Don't those beds just look so comfy? Makes me want to take a nap right now. So that is what I'd like to go for, but we'll see what I come up with. -So after my vlog last week, I was looking at iTunes U on my new iPad and discovered that Liberty University has a microbiology course on there! I've been watching the lectures, and I love it. Makes me want to go buy a microscope. Also, I think I should have gone to Liberty - I love how they look at these subjects from a Christian perspective! -Derek and I started watching a new (to us) show this week - Lie To Me. If you haven't seen it, the show is about a psychologist who studies people's facial expressions and body language to determine whether they are lying or not. And he helps people solve crimes and stuff. But I'm finding the facial expression/body language stuff fascinating! I tried to see if there was a class on iTunes U about psychology and body language, but so far I haven't found anything. -We also watch Survivor on Hulu. Neither Derek or I had ever watched Survivor until a month or two ago, and so we've been watching some old seasons, and I think we're addicted now! But we were watching last night, and I totally identified shame by watching one of the contestants talk. I knew it was shame because of what I learned on Lie To Me. So I knew she wasn't lying. I'm so impressed with myself. -I really have done more this week than just watch TV. I've read a lot, and . . . that's about it. It's been a pretty laid-back week, and it's just what I needed. I'm reading this book right now, and it is good! If you are a blogger, you can request it for free here. -I also called the hospital about my bill from when I had Gwen. They messed it up the first time, so they were supposed to cancel it with my insurance and resubmit it . . . and they still haven't done it! Four months later! I'm pretty frustrated. I just want to pay my bill already! These things always hang over my head until I know I don't owe anything. Anyway, I think I'm just going to call and bug them about it every week until they fix it and send me my bill. -I've been playing a lot with the kids this week. They are just so cute! I could stare at my kids all day. Wyatt is talking so much lately, and it's so fun! And Gwen will be four months (!) tomorrow. Look for a post next week! This is a hard question for me, because there are lots of things I could work on. But I'm going to say that one thing I should work on is realizing that Derek needs some down time. I'm kind of a supervisor by nature, so a lot of times when Derek gets home I'll ask for his help with different things so that we can finish all the work and spend some time relaxing together. But I have to remember that even when I might be tired from taking care of the kids by myself all day (or all week, if he's been gone), he's been working too, and I should try not to ask him to do too much right away. Maybe I need to do more of it myself. Maybe I need to let some of it slide for the night. But letting Derek have more time to just do nothing would be a good thing. Then he'd probably be more re-charged and ready to help me anyway! And I want our home to feel like a haven, not like just another place where he has to work. I love that even though we are so different we still think the same on so many different things. Derek and I have very different personalities. I'm a little Type-A; I like to have things planned and organized. Derek likes to go with the flow. He's more laid-back and I'm more uptight about things (particularly time management and things like that). However, even though we are totally different (opposites attract held true for us), we also think so much alike about issues - our beliefs, how we want to raise our kids, politics. It crazy to me how many things we agree on, especially considering how different our personalities are! I think we were definitely meant to be together, because we agree on the important things, and we balance each other out on the personality thing. Because let's face it, the world will not end if the kitchen sink is not perfectly clean. I'm still working on that one. I love that no matter how big of a disagreement we have, we both know that neither of us will leave. We've had some pretty good arguments in our years together so far, including times when one or the other of us has had to leave the house to cool down (Starbucks always works for me). But I know that no matter what, we're both in this for the long haul. And we'll pull through the rough patches, because it's both our desire to grow old together. That means more than any silly argument. Unrivaled by Siri Mitchell is a story set in St. Louis in the early 1900's. Lucy Kendall returns from a European tour with tons of ideas for a new candy that will help save her father's struggling confectionary, but no matter what she tries, it's not enough. At the same time Charlie Clark comes to town and is reunited with his father, who owns a rival candy company. Charlie and Lucy have a connection right away, but it's quickly stifled when Lucy realized Charlie is the son of her father's archenemy. I enjoyed this book. The Christian message is pretty light in it, but it's there - the message that it doesn't matter what we have done, it matters what God has done to save us. I liked the character development in the book s Lucy realizes that she has done some things wrong and that her preconceived notions about the Clarks may not be correct. The romance in the book was cute, and the story kept me interested. You could also tell the author did her research, which I always appreciate - I enjoyed this book! I would recommend it. This week I wanted to get some pictures of my kids' hair - Wyatt's thick, messy blonde mop, and Gwen's wispy, soft hair with a bald spot in the back. And I thought I'd throw in a couple smiling pictures for good measure, and just because my kids are so cute! Remember a few weeks ago when I reviewed The Christian Mama's Guide To Parenting A Toddler by Erin MacPherson? I enjoyed it so much that I ordered The Christian Mama's Guide To Baby's First Year next. I enjoyed this book just as much as the other one I read in this series! MacPherson covers everything from breastfeeding to baby gear to losing the baby weight, and she does it in a fun and relatable way. I agreed with so much of what she says in this book, and Derek kept asking me what I was laughing at while I was reading - and I was usually laughing at myself, because I've thought so many of the things that Macpherson says in the book! I've been enjoying these books because I've found them to be so encouraging. They're a good reminder that motherhood is hard sometimes, and it's not going to look perfect, and that's okay - you are still a good mom. And you are in good company. That's something I need to hear (or read) sometimes when there are toys and piles of clothes scattered everywhere, the dog is barking, the baby's crying, and the toddler is getting Nutella all over the furniture. It's normal, and it's precious. And let's face it, it's funny. Being reminded to laugh and enjoy it is priceless. P.S. I also have to note that the author, Erin MacPherson, actually came over and commented on my review of the toddler book that I posted a few weeks ago! I was very impressed and thought it was pretty classy of her to comment on the reviews of her books. 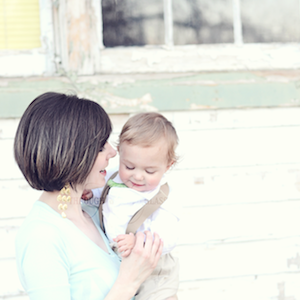 You all should also check out her blog, The Christian Mama's Guide. It's been a little while since I did just a general, life-update post, so it's bullet points today! -On Saturday Derek and I went to see Sense And Sensibility The Musical! I love going to plays. Derek goes because he knows I like to go. I feel like we have to be a little picky about the ones we go to see though, because so many of them are trash these days. But I really wanted to see this one! I'm a big Jane Austen fan! They did a really nice job with the play, I thought - they focused a little bit more on Mr. and Mrs. Jennings and their relationship than they do in the movie or the book, which I thought was a fun take on the story. I also really liked the girl they got to play Marianne - she was very emotionally-driven like she was supposed to be, but in a more happy way, which I liked. It was just good! Afterward we went out to dinner and then got some blended Chai at a place in the mall. It was just nice to get out on a date again. It's been awhile! -Derek also surprised me and got me an iPad! I know! He got a deal with one of his classes and basically got it for super-cheap. It hasn't come in the mail yet, but I'm waiting with bated breath. I made the mistake of reading a few blogs on Derek's iPad a couple weeks ago, and I've been pining after one since, but I never expected him to actually buy me one! -I've been reading like crazy the last few days, because I'm reviewing a few books and I'm trying to finish them and get my reviews up. They'll probably be on the blog tomorrow. And now I'm trying to finish a couple of my other books before the next batch of review books comes. It's nice though - I miss reading. Since January I kind of dropped off on the amount of reading I was doing, but reviewing books gives me a good outside motivator to actually sit down and force myself to relax and read. -We are finally all done being sick, I think. Last week Wyatt and Gwen were both sick and cranky, and pretty much didn't sleep at all, I was not feeling well either, and Derek wasn't here . . . it was just a rough week. I have high hopes that this week will be easier! -I'm cleaning out everyone's clothes today and attempting to reorganize while also keeping my two littles happy. I think it's the spring cleaning bug. Wish me luck. Alternatively Titled "A Little Blogger Pep Talk". I was doing some blog maintenance the other day, and came across an old post that I wrote three years ago about a right-hand ring Derek surprised me with. You can check it out here, but don't expect anything particularly eloquent. I think it took me a grand total of 5 minutes to put together. Not my best work, but it was sweet of him to give it to me for no reason and it was something I wanted to remember! Why do I mention it here? Because, guys, I got 20 comments on that post. Twenty comments! On a post with a couple pictures and a hastily-typed brag session on my husband. I'm lucky to get 20 comments today on a post about one of my kids with tons of good pictures and beautiful words. And I had way less followers back when I wrote that post than I do today. For those of you have been blogging for a while (by a while I mean more than two years), you know what I'm talking about. You remember the day too when your most boring post would still yield at least a 1:5 commenter to follower ratio. Those were the good ole' days. Commenting is on the decline. No, it's not because you are getting more boring. More people are reading blogs than ever before, but alas, they are doing most of that reading on mobile devices. And it's hard to comment on smart phones and iPads. Trust me, I know. Commenters, I do not blame you one bit. I don't comment much with my smartphone either. I've done a brief survey (i.e. checked a couple other blogs), and I think 5% is the best you can hope for now. 5% of your reported number of followers may comment on any given post. Scratch that. Only on the really good posts. Usually the percentage is lower than that. I'm just telling you all this to say - never fear! It's normal. And even though not many are commenting, people are still reading. Which is why I never let the number of comments get me down! There ya go. Blogger pep talk of the day. P.S. The picture has absolutely nothing to do with this post. The other day Wyatt decided that it would be fun to take his Easter stickers and put one on each of his cars. I thought it was so cute! (1) I love that he is kind. I always knew I wanted to marry a kind person, and I hit the jackpot with Derek. I was reminded of this last weekend - I woke up feeling sicker than I have in years. My throat was raw, my sinuses were plugged, my chest was congested, I was wheezing, and pretty much my whole face hurt. Derek woke up at 6:00 AM and took Wyatt to the store (20 minutes away) to buy me some Mucinex. Then he came home, called to exchange our tickets to Sense and Sensibility: The Musical (we were supposed to go last weekend, so I was glad he was able to exchange the tickets - so excited!). He let me sleep in and just brought Gwen to me for feedings. Then he decided he needed to go shopping for some new shirts for work, so he packed up both kids and headed out of the house for several hours so that I would have a chance to be lazy, take a bath, blog, and watch Hulu. Can you say sweet? He is always trying to think of things to do for me, but what I love is that he isn't just kind to me. He tips generously. He takes care of his mom. He likes to surprise people with gifts, paying for dinner, etc. He is a kind person - that's just who he is. (2) I love that he is a spiritual leader for our family. A couple weeks ago at church I had to go down to the nursing room to feed Gwen, and I finished right around the time the service ended. I waited for Derek to come downstairs from the service, and when he did he handed me a pamphlet for our missionary support team, and told me he saw it and thought it would be cool to get involved in that. I love that he wants to model Jesus's servant attitude for our family. (3) I love his face. I have one good-looking husband. Enough said. I was looking through these pictures and it hit me again that these kids are mine. That little boy calls me "mama". When that baby girl cries, she wants me. Could I be any more blessed?